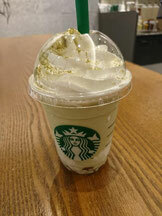 Starbucks Houjitea cream flappetino, Houji is roasted green tea. The flappetino use special houjitea leaves in Kanazawa.If you like greentea it might be good! !